Now You Can Reach the Unreachable Itch! Reach N Scratch Bendable Back Scratcher by Kinsman - Molded plastic fingers and an extra long handle make it ideal for those hard to reach places that itch. Handle can be easily bent to desired shape. Folds conveniently to hang, store or for travel. The Reach N Scratch Bendable Back Scratcher is designed to scratch those hard-to-reach places. Unlike traditional back scratchers, the Reach N Scratch has the ability to be bent into an unlimited number of shapes. Because users can customize the back scratcher to their needs, it is great for all ages. Simply bend the Reach N Scratch as desired to scratch the back and lower extremities. Easy to use and store, this scratcher is great for at home use or while traveling. 24” Long Handle can be bent into any desired shape. Designed to scratch hard to reach places. 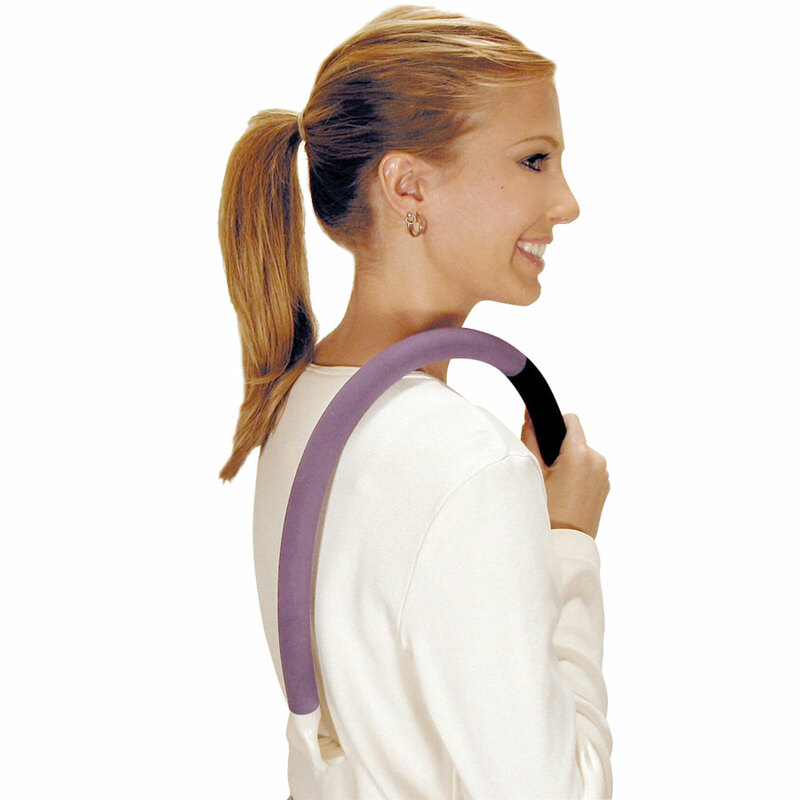 Ideal for use at home or while traveling. Indications: To help scratch areas of the body for individuals with minimal range of motion or reach. Allergies & irritations on your face or body can cause itching. Try some of these remedies for skin itching treatments. Itchy skin is known as pruritus and causes irritation and tingling of the skin. Excessive itching of the skin may also result in red patches which can be embarrassing. Understanding the underlying cause of itchy facial skin will aid in curing this skin issue. Itching of the face is something that every person may experience on a frequent basis. There are many factors that contribute to this problem. Exposure to the sun, environmental problems like dust dirt and pollution can cause an itchy face skin. Excessive heat and cold also affect the skin, making it dry and itchy. Sometimes cosmetics irritate the skin and cause allergies of the facial skin. Skin diseases are also related to an itchy skin like, eczema which makes the skin red and inflamed, Psoriasis that produces thick red plaques covered with silvery scales, Rosacea, a red inflammation that appears on the nose, cheeks, chin and forehead and Acne. 1. Cut your nails short and try tapping the affected area, rather than scratching it. Wear cotton gloves at night to avoid damage to the skin at night, while sleeping. 1. Use cool or lukewarm water, not hot water as it can burn the skin. Avoid using perfumed soap, shower gel or deodorants. 2. After a bath, dab the skin instead of rubbing it with a towel, as itching may increase. 1. Don’t wear clothes that can irritate the skin such as wool and synthetics. Wear cotton or silk as much as possible and avoid tight fitting clothes. 2. An Itchy skin is also known as Pruritis. It is an annoying sensation that makes you want to scratch that particular area which is affected, to get immediate relief. 1. DRY SKIN: A common cause for an itchy skin is dryness. Dryness is a result of many factors such as hot and cold weather, excessive use of air conditioning, central heating and bathing a lot. 2. IRRITATION AND ALLERGIC REACTIONS: Wool, chemicals, soaps and other substances can cause an itchy skin. Cosmetics are also a reason for the skin to itch. Food allergies can instigate the skin to itch as well. 3. PREGNANCY: During pregnancy, women are prone to an itchy skin. The main areas which are affected include the thighs, the arms, the breasts and the abdomen. 2. DRY SKIN: A dry skin is caused due to the environmental conditions prevailing. 3. TAUTNESS OF THE SKIN: When the skin is affected, it becomes taut and inflamed. How to Cure Itchy Skin On Face? 1. PETROLEUM JELLY: Apply some petroleum jelly onto the skin and leave it on overnight. Rinse the next morning with a perfume free mild face wash. Get rid of an itchy face with this lovely home remedy. 2. LEMON: Apply a little lemon juice onto the affected area with clean hands. Once the juice dries, you can wash your face with cold water. Repeat this twice a week for best results. This is another great face allergy treatment which works wonders for your skin. Do try it out! 3. TULSI LEAVES: Boil a few of these leaves in water. Then take a cloth and dip it into the concoction and apply it to the affected area. Let it dry on the skin and then rinse with cool water. Repeat daily until you find some difference. This home remedy for itching skin too is very effective. I truly am VERY HAPPY I bought this back scratcher! It is exactly what I was looking for. The thing can bend into any shape. The "hand" is the only part of this scratcher that doesn't bend. It's very heavy duty and though it's easy to bend it stays bent as you use it. It's not like you bend it and try to use it and then it unbends. I'm super happy with the "hand" it's big, but not huge. And it scratches, but doesn't cut you or irritate like some of them do. Totally going to order a couple more! !